The length of the string can be varied by dragging the stand to the left/right. The tension in the string can hence be changed. When a stationary wave of wavelength λn is formed, there are n loops formed in the string. Each stationary wave is a normal mode of the system. Besides the normal modes, the string has infinite modes of oscillations, e.g., plucking the string at any point on it. However, any mode can be represented by a series sum of the normal modes of different amplitudes. An analogy in mathematics is that any 3D vector can be expressed like P→ = a i→ + b j→+ c k→, where i→, j→ and k→ are the unit vectors. The system is forced to oscillate when a periodic force is applied to it. 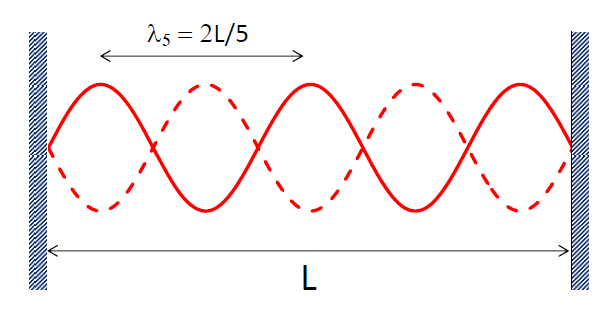 When the frequency of the periodic force matches with one of the frequencies fn = wave speed / λn, resonance will occur. Then, stationary wave of that normal mode appears on the string. When the system is forced to oscillate at off-resonance, the oscillation is a combination of the neighboring modes. The resultant amplitude is usually small becuse none of the normal modes is dominant.